You thought that animals ate plants, or grass or some other ‘food’ natural to their species. However, animals don’t only need protein and energy, they also need vitamins and minerals. Feeding livestock is a complicated task and the global feed additives market continues to be a growing industry. Animal feed is a formulated mixture created by animal nutritionists to provide the animal with the necessary balanced nutrients for proper growth, development and maintenance. Feed is designed to compensate for nutrients and supplements that may be absent from an animal's natural diet. Feed additives are supplements including vitamins, amino acids, fatty acids and minerals used in animal nutrition for purposes of improving the quality of feed and the quality of food from animal origin, or to improve the animals’ performance and health. The basic manufacturing process begins as raw materials are conveyed from storage silos to reactors through weigh hoppers. From the reactors, product is routed to product coolers and is then conveyed though enclosed systems, where material is sorted, blended, and sent to the packaging areas. Odors, VOCs, including Sulphur based compounds, and ammonia are often released to the atmosphere during the production process. Thermal oxidation is the most widely accepted control technology available to control the odors, VOC emissions and ammonia from animal feed manufacturing processes. 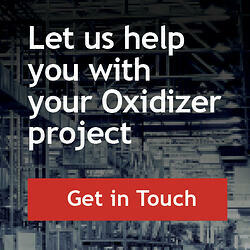 Oxidation of VOCs and other air pollutants works by simply oxidizing the air pollutants with oxygen and heat. In this environment the VOCs are converted to harmless inert byproducts like CO2, water vapor (H2O), and usable heat. These harmless by-products are released to the atmosphere or used within primary or secondary energy recovery techniques to further lower the operational costs. CPI installed three (3) QUADRANT-SR, recuperative thermal oxidizers at a Southern USA animal health and nutrition company for the abatement of odors, VOCs and ammonia from the animal feed manufacturing process. 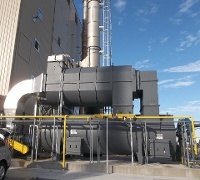 The air streams from each fully enclosed reactor/dryer, conveyor, and dust collection system are ducted to one of three thermal oxidizers. Although the production process equipment included various filter systems, CPI provided a prefilter designed to trap particulate matter that may escape in upset conditions. The 18,000 SCFM, 13,000 SCFM and 10,000 SCFM recuperative thermal oxidizers destroy the Sulfur based VOCs and ammonia emissions from the process with 99.5% destruction efficiency (DRE) and 70% thermal efficiency. 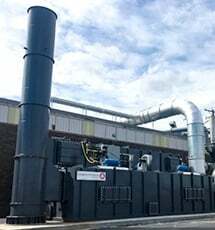 Each CPI recuperative thermal oxidizer uses an air to air heat exchanger to preheat the incoming process air using the clean “hot” air from the oxidizer combustion chamber. This primary heat recovery raises the temperature of the process gas before entering the combustion chamber, resulting in lower fuel requirements for the oxidizer burner system. 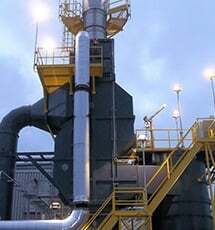 The recuperative thermal oxidizers incorporate a floating shell and tube primary heat exchanger which eliminates thermal stress and fatigue by allowing each individual tube to expand and contract at its own rate, provides lower operating costs for the customer, and meet operational requirements. The recuperative thermal oxidizers are unaffected by contamination, (silicone, heavy metals, particulate, etc.) and allow for the highest VOC destruction over the life of the system. 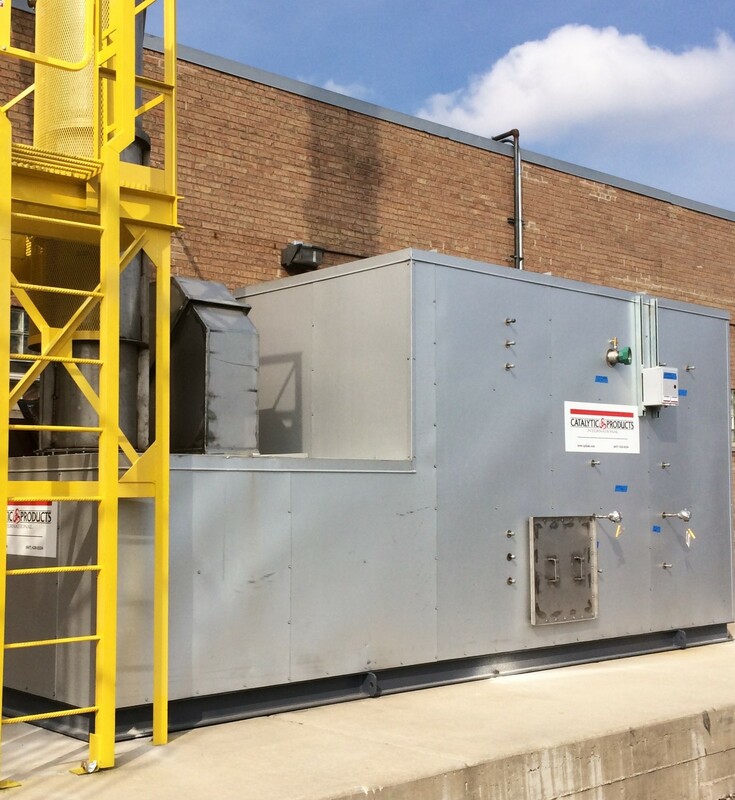 CPI worked closely with the customer while providing engineering services, drawings, and support for the complete installation of the recuperative thermal oxidizer. CPI was able to complete a good portion of the installation activities before the new unit arrived on site for final assembly. This approach guaranteed that entire system was installed correctly, and the facility was back up and producing product with minimal downtime. Since 1969, CPI has been enabling clean production as a leading supplier of air pollution control solutions. CPI is at the forefront in providing industries including animal feed manufacturing companies with solutions to their air pollution control needs.